Pink Floyd prevailed against their record label over the iTunes sales method, which siphons profits through a $.99 sieve. The case was heard by U.K.’s High Court. The band’s 1999 contract prohibited EMI, its label since 1967, from selling songs in a way that could disrupt the “integrity” of the albums. BBC: In court, Chancellor Sir Andrew Morritt said the contract contained a clause to “preserve the artistic integrity of the albums”. He said the contract meant EMI were “not entitled to exploit recording by online distribution or by any other means other than the original album, without the consent of Pink Floyd”. 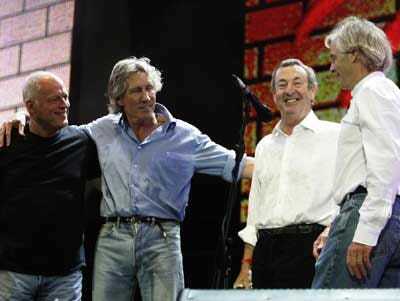 The band largely avoided releasing singles during their career, instead preferring fans to listen to entire albums such as Dark Side of the Moon, which has sold more than 35 million copies around the world. EMI was ordered to cough up £40,000, or about $60,000, to pay the band’s legal fees while the court calculates how much the company owes in damages and fines. The ruling is just part of a protracted legal battle with EMI over unpaid royalties that has been going on for more than a year. For those hoping for some last minute single-snatching, it’s time to hurry. As Rolling Stone and All Things D have pointed out, you can still buy the singles via iTunes and Amazon.com right now. Guess this means future generations of high school seniors will have to buy Wish You Were Here in its entirety, and they have Roger Waters and mates to thank.